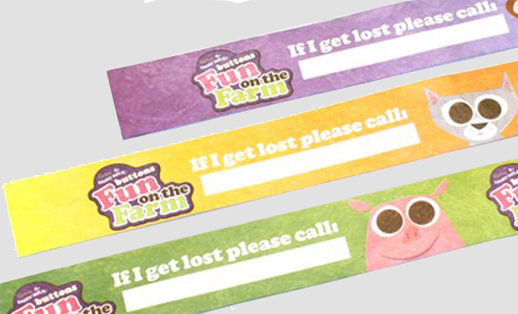 Personalised wristbands are a branded band of material (Tyvek, PVC vinyl or fabric) which is worn around the wrist, and quite hard to remove, and reattach. They are very common at ticketed events and promotions. When a more durable wristband is required (for a weekend festival for instance), then vinyl wristbands are often utilised. Vinyl wristbands tend to be branded with one colour screen printed onto the PVC, black, white, gold are typical examples of print onto these bands. Available in three styles as 'click to basket' products here. The traditional Vinyl wristband (TradBand), with a deeper 50mm x 19mm print area, available in 18 colours [Colours and template here], the 2000 series, in 24 colours including clear vinyl, which is a straight band with a 100mm x 15mm print area [Colours and template here]. And the curvey 'Kool' band, with it's distinctive wavey edges, available in 16 colours, with a 90mm x 15mm print area [Colours and template here]. Vinyl wristbands are harder to remove than Tyvek, you'll just have to cut it off. Don't fold over the access vinyl, it will weaken the popper seal. Cut off the excess vinyl. The creme de la creme of non-transferable security wristbands are the fabric wristbands, which have fast become a must-have on the festival and nightclub scene. Fabric wristbands are woven satin and feature a mix of UV, metallic and security printed threads with several different types of locking mechanism, these things don't come off unless cut off. 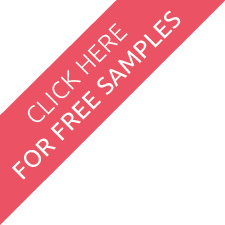 Fabric wristbands are the most comfortable to wear and you can guarantee that you're wristband will stay on the owner for weeks after your event. If a patron is attempting to use a spoilt wristband, it is usually pretty obvious. They will try to keep full visibility from you, by keeping their arm down or tight to their body. The simple security test for a wristband is to ask for the patron to put their arm forward, then hook a finger underneath the band, and yank it towards you. If the wristband is spoilt, it will come away in your hand. How Do I Attach A Security Wristband To A Wrist? Ask the patron to pull up their sleeve and take the arm towards you. keeping two fingers to the skin, wrap the band around the wrist, and secure. The two fingers will give enough space for movement, but tight enough for the patron to not be able to remove and transfer the band to a friend.